Haze, a new weather app from Robocat, offers up a clean, colorful design and animated backgrounds that accompany weather forecasts. It is similar in appearance to weather app Solar, but Haze incorporates touch gestures allowing users to navigate through information like temperature, sunrise and sunset times, rain predictions, and wind factor. Despite its surprisingly minimal appearance, Haze is feature rich. 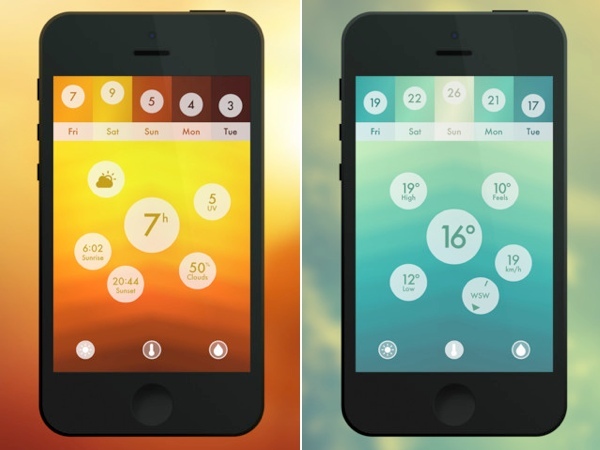 The app includes different unlockable colored themes for a personalized look and it also provides a five day forecast of the weather with a downward swipe. Looks really cool. But i prefer being able to see these things without having to click many times. No minimalism for me, thank you very much. When it's sunny I just want to see an anthropomorphic sun wearing sunglasses. Why the heck do you guys (Macrumors) promote every weather app that comes out? This is getting silly. Unless I'm missing something, we covered Dark Sky last year and now this one...two apps in the nearly five-year history of the App Store. That hardly qualifies as "every weather app". I really appreciate the design of a lot of these gesture-controlled apps but the problem is that there are few clear platform standards (pinch to zoom, etc.) and it basically means as the number of gesture apps grows, I would have to relearn the app each time I used one. Agreed. Gestures based-app are like shortkey-based apps for your desktop: quick and useful once your learn it. But you have to learn it, which is too much of a hassle for something as simple as the weather. Gestures should be complementary to buttons. Nevertheless, I haven't checked out this specific app. But in general, the above is my opinion on gesture based apps. The triumph of form over function. Weather shouldn't be something for people to manage. Just info. Yay another app that does the same thing as the built in weather app except with a crappy interface, no functional advantage, and I get the privilege of paying for it too? What a great deal! Honestly, 4 years after the opening of the App Store and this website is promoting a frickin useless eye candy weather app? This is a joke. If this is the type of crap that gets iphone users excited, then apple REALLY needs to start redesigning this OS asap. I feel like its still 2009 sometimes when I come here. Exactly. Gestures are the new keyboard shortcut! Gesture-heavy apps can LOOK cool (see: Metro) but except for a few very standard gestures (cross-out delete, pinch zoom, pull to reload) they shouldn't be necessary for anything. I consider these gesture apps novelties. I salute them, but they're not the future. I want to know a lot more than the widget will show me (and Yahoo! weather doesn't seem all that accurate for me). I want to know how much time I have before a storm hits. I want to know what part of the day tomorrow will be good weather. I use Dark Sky plus Weather Underground or Weatherbug (haven't decided) on iPhone. On iPad I use Dark Sky plus Wundermap. Why do I need another weather app? If I just want to know the temperature, the standard weather app does the trick just fine. If I want to see a radar, I open the Weather Channel app. The fact that people keep thinking a different take on the same old information is worthy of an iOS app investment is mindbogglingly absurd. It reminds of the devs that keep trying to reinvent email. Apple always touts a new email feature when OS X or iOS versions update, Sparrow, now these folks "waiting in line" for the Mailbox app. It's email for Christ Sake. There's just not much info you need than the general for the weather folks.